I didn’t grow up eating eggplant. In my family, broccoli was about as exotic as produce got. But I was hooked the first time I tasted the Mediterranean vegetable in a slow-cooked ratatouille served by a friend. Properly prepared eggplant is a luscious vegetable with the texture of velvet and a mild flavor that harmonizes beautifully with late season tomatoes and peppers. Throughout the summer, we often grill long, slender Asian eggplants to accompany a piece of fish or meat for dinner. 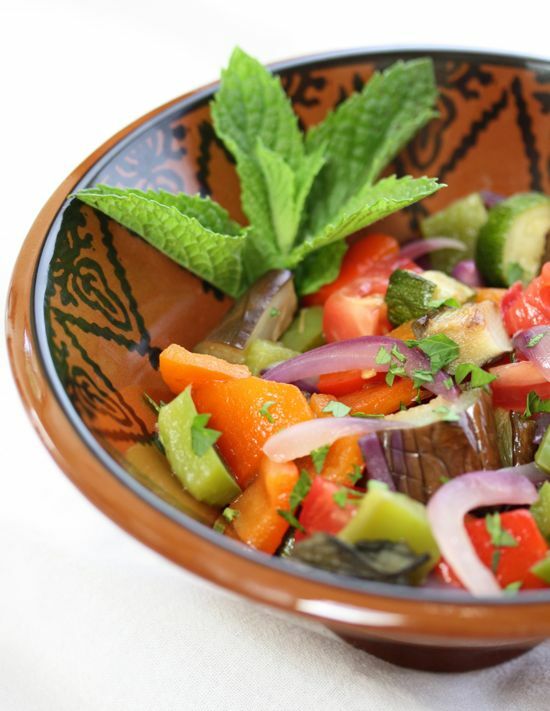 So I was intrigued by the idea of grilling the ingredients for a Moroccan vegetable salad when I ran across an old recipe in my files from Jozseph Shultz, owner of the recently resurrected India Joze cafe in Santa Cruz. His directions called for stir-frying the vegetables in a wok. After a little research in Claudia Roden’s “The New Book of Middle Eastern Food,” (Knopff. 2000), I decided to turn up the heat as well by seasoning the dressing with cumin and a touch of harissa, a fiery Moroccan chile paste now in available many markets. The result is a lively salad packed with all the best flavors of late August. Grilling adds a nice smoky note to the eggplant and brings out the sweetness of the peppers and onions. This salad works well as a side dish at dinner but is substantial enough to serve as a light lunch or a vegetarian pot luck offering. Although it can be made ahead and refrigerated, I like it best at room temperature. Just take it out of the fridge about half an hour or so before serving to let the flavors blossom. Slice eggplants, peppers, onion and zucchini in half vertically, spearing the onion crosswise with a bamboo skewer or toothpicks to hold the layers together. Brush the vegetables with 2 tablespoons of the oil and season lightly with salt and pepper. Grill over medium heat, turning as necessary, until eggplants just begin to collapse in on themselves and the onions and zucchini are tender. The peppers should blacken and blister on the skin side. Remove vegetables from grill and place peppers in a sealed paper bag for 10 or 15 minutes, until they’re cool enough to handle and peel. Cut the eggplant, zucchini and peeled peppers into bite-sized chunks. Slice the onion lengthwise into slivers. Whisk together the remaining olive oil, vinegar, garlic, harissa and cumin in a small bowl. Season with salt and pepper to taste. The dressing should be spicy but not incendiary. Combine the vegetables with the dressing in a large bowl. Add the chopped tomato, parsley and mint. Toss gently until well mixed and serve. Note: Harissa is available in Middle Eastern markets and specialty grocers like Whole Foods. If you can’t find it, though, you may substitute the more widely available Asian chile paste known as sambal oelek or a mixture of paprika and ground chile (not chili powder).